We are owned and operated by Sir Hugh and Lady Blackett. Sir Hugh’s great great grandfather built Matfen Hall in 1832. Since that day, it has been welcoming guests - from family and friends, whilst it was one of the Blackett residences, to our guests since 1999 when we opened as a hotel. The fact that we are family owned filters through all our service. We love to welcome our guests as if they are our family friends – something that is synonymous with our region. We’d love to welcome you soon! In 2016, we achieved zero to landfill: all non-bakery food leftovers, such as glass, plastics, cardboard and cooking oil, are collected by a recycling company. This is used to harness electricity or converted into fertiliser then used on the Matfen Hall site. The zero to landfill policy is the latest development in a phased programme of sustainability which we began in 2011 with the conversion of a former staff bungalow into a state-of-the-art boiler house. Woodchips from our estate’s 500 acres of woodland are fed into a giant bio-mass boiler, creating hot water and, consequently, heating, which is supplied to the hotel though a network of heavily insulated underground pipes. The woodchips themselves are a by-product of a managed programme of tree thinning on the estate and, by using local woodland and resources, Matfen Hall has reduced its transportation needs and improved its carbon footprint. By using its own timber as fuel, the hotel is also creating and sustaining the local economy within timber processing and transport, woodland and forestry management industries. In addition, the hotel’s 27-hole golf course is committed to restricting the use of chemicals on its green, while the pool within the Aqua Vitae leisure spa uses a UV light filtration system to reduce the amount of chlorine needed. Each year our team chooses a local charity for the to hotel support. In the past we have raised over £10,000 for Josie’s Dragonfly Trust and over £1,000 in one week for Comic Relief. This year we chose Tynedale Hospice. 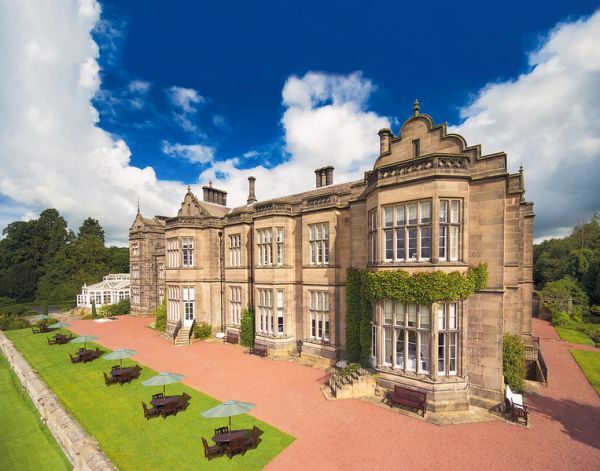 A common perception of stately home hotels is that they can be quite old-fashioned. At Matfen Hall, nothing could be further from the truth. Whilst we are respectful of our history and love that fact that the Hall has been such a large part of Northumberland’s history, we are very mindful that we must keep ahead of the game. We have state of the art gym facilities that link training programs through ‘the wellness cloud’; we have driven high programs for rural connectivity; and we are launching a new interactive website in 2017. We’re sure Sir Edward Blackett, who built the hall and was considered to be a man of the future in the 1800’s, would be proud of us today. We hope you'll feel them same after a night at Matfen Hall.